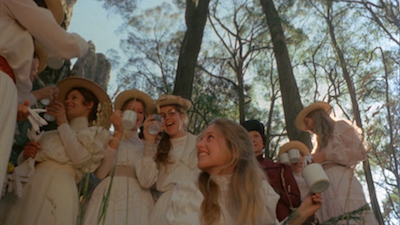 The biggest strength Peter Weir’s 1985 adaptation of Picnic at Hanging Rock has going for it is its air of mystery, and that atmosphere manages to sustain itself due to the succinctness of Cliff Green’s script and a steady restraint at the helm. 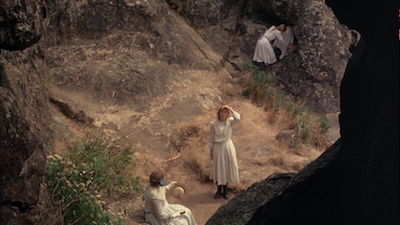 Picnic at Hanging Rock has a trim 107-minute running time in which a lot happens, little is explained, and yet we get just enough. Capturing a similar dread would likely be the biggest challenge of Amazon’s current long-form remake. Sure, they likely can extract more from Joan Lindsay’s novel, but will it be at the sacrifice of Weir’s persistent ambiguity? 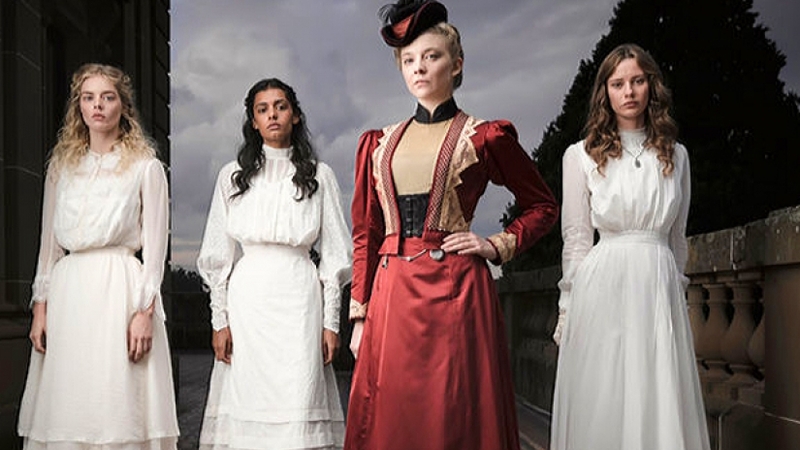 The story of Picnic at Hanging Rock begins on Valentine’s Day 1900 at an Australian boarding school for girls. As a celebration of the holiday, the students head out on an excursion to a mountainous wilderness marked by its volcanic rock formations. Only one girl, the quiet and brooding Sara (Margaret Nelson), is forbidden to go, held back by the sadistic headmistress (Rachel Roberts) and her strange assistant (Kirsty Child). Late in the afternoon, four of the girls, including Sara’s roommate Miranda (Anne Lambert)--whom Sara and seemingly everyone else is obsessed with--go off exploring on their own. Only one returns, and one of the accompanying teachers (Vivean Gray) likewise vanishes when she goes to retrieve the missing pupils. No one saw a thing. The girls were all napping when the this went down, and perhaps in no small coincidence, the explorers also took a nap at the same time, surrounding a flat rock next to several large totemic outcroppings, like effigies abandoned at Stonehenge. Were there mystical shenanigans going on? Surprisingly, no one ever really suggests it, but there is an aura of a haunting hanging all over Weir’s film. 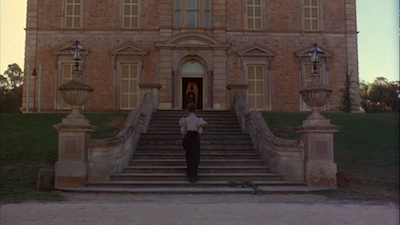 The rest of Picnic at Hanging Rock is concerned with the lingering questions: where did the girls go? How could there be no clues? The young son of a wealthy General becomes obsessed with the case. The boy (Dominic Guard) and the family servant (John Jarrett) were the last to see the girls before they headed into God knows where. 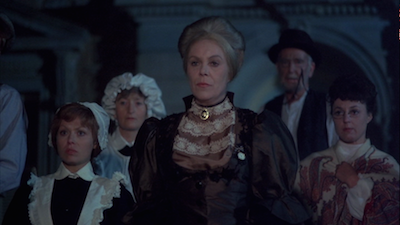 Another teacher chaperoning the trip, a French woman (Helen Morse), tries to hold everyone together, but she starts to see the darkness lurking in the corners of the school. It’s not quite Suspiria-levels of intrigue, but there is something untoward happening behind closed doors all the same. Is this event perhaps some kind of karmic retribution? 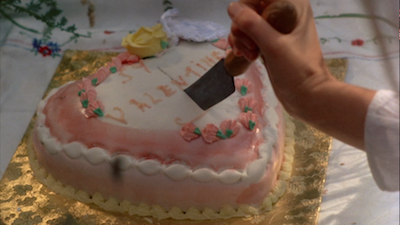 Or did the girls merely escape a troublesome fate for some kind of unknowable liberation? The only aspect where Weir nearly pushes things from the ambiguous to the obvious is the music. The score alternates between Zamfir’s pastoral pan flute and ambient electronic music by Bruce Smeaton, the latter of which particularly vibrates with its own sense of “ooooh, isn’t this weird.” Weir’s employment of these tones are often used to shine a light on particular moments where things are supposed to go wrong, or we are supposed to be unnerved; the cues are mostly unnecessary. 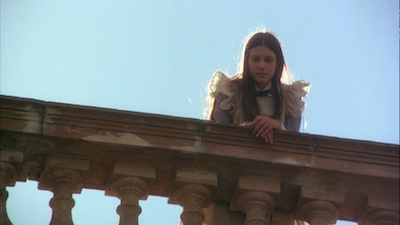 While the girls’ disappearance in Picnic at Hanging Rock has the direct result of exposing shady goings-on at the boarding school, there is also a more broad exposure of how society tries to stifle young women entering adulthood. Whenever discussing the health of any of these girls, the first concern is whether or not they were sexually assaulted. The doctor describes them as being “intact.” Yet what do the repressive policies, and the fear of these girls’ emerging sexuality, contribute to the overall scenario? There are the two young men who leer at the girls as they enter the untamed wilds, or the details like the missing teacher seen wandering off without her skirt, or the fact that one girl returns without her corset. Or the strange punishments visited on Sara. How much of this is a result of the prim and proper social mores stifling natural impulses? These are layers that only start to reveal themselves the more you watch, when the details of the disappearing act start to matter less and you can start to appreciate everything going on around it. Judging by the first episode of the Amazon Picnic at Hanging Rock, there will be some of this subtext at play--but it looks likely to be made overt text. The production looks likely to leave no stone unturned, beginning its initial outing with Mrs. Appleyard (hear played by Natalie Dormer as a much sexier widow) buying the estate that will become her school while confessing to her own false face in voiceover. Oh, goody, an origin story! With a shiny modern style, the series amps up the drama and the adolescence CW-style. 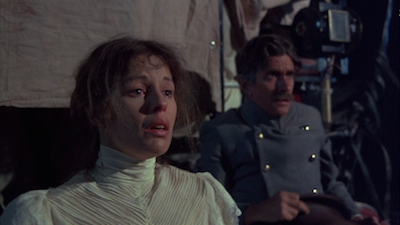 The pilot is all preamble and portents, including Edith getting her first period (“You can now have a baby!”) and Appleyard underlining how dangerous the Hanging Rock can be. 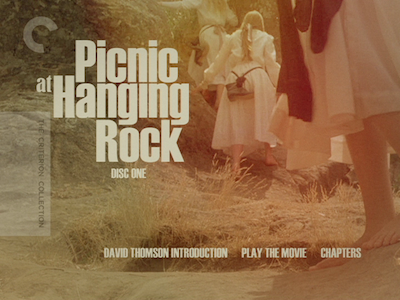 Jury’s still out if this Picnic at Hanging Rock is any good in its own right (and still out on whether or not I’ll even keep watching; I didn’t feel compelled to hit the “next” button), but for those looking for a similar creepy excursion to Peter Weir’s original adaptation, keep looking. The PaHR tv series was made by Foxtel in Australia and looks like it is available via Amazon in the US. Reviews haven't been favourable here (Aust) but this could be largely because they are always of the "it's not the movie" kind and we're a country that does like to criticism its own work. The comparison is of course inevitable but taken on it's own merits I found the 6 part season a worthwhile and entertaining work. It's also not trying to recreate the film - or, as many seem to think, take something away from the original (which still exists, amazing!). I was uncertain about Natalie Dormer's casting throughout - she's very good I'm just not sure it was the right direction for the role. The girls are largely excellent and the production design is gorgeous (the costumes in particular are superb). I was also pleased they went with ambient electronics for the soundtrack ditching the pan pipes :)The small but incongruous touches like the shocking pink titles were also a nice addition.